Chronicles of a Casual: Wait, Where Did That Other "n" Come From? Wait, Where Did That Other "n" Come From? Oh my a lot has happened since my words last graced this blog. My last post was my non-heroic BIS Ret list. Lol. Non-heroic. Since I posted that, a lot has happened in the game. I learned how to tank with my face on my druid, Lifehack. I resurrected (ankh'd?) my shaman Syntaxx, LFR-style, and oh yeah, I server changed and got Jack into a new guild. And I (had to) change his name to Jacklalanne. Just a couple of changes. Rewinding a bit, I'd like to go over the reasons why I'm no longer raiding in my previous guild, Cereal Killers. To start, I want to say that leaving wasn't a simple or easy decision. CK has some people in it I've been playing WoW with for at least five years. As a group of people, I've always enjoyed them immensely. Speaking specifically of our 10 man raid group, everybody involved was fun loving and awesome to play this game with. Sure, I bitched on twitter a lot. More than I should have. Cereal Killers is a very casual guild with a few full time raiders that may or may not be in varying degrees of disenchantment with World of Warcraft. We weren't on the bleeding edge of progression by a long shot. Our first Madness of Deathwing kill was, I think, three weeks ago. Something I'm still proud of them for. Given the casual nature of our approach to raiding, sometimes I found issues with the way we dealt with our own progression. Those issues weren't the main reason I left the guild. They were a factor, yes, but a minor one. My biggest issue with CK raiding was the hours. Our schedule was Tuesday, Wednesday, Thursday, from 10PM to 1AM. I have a job. That job has me out of bed around 7-7:30AM 5 days a week. Several months of getting 6 hours or so of sleep 3 days a week was starting to wear me down. Migraines, grouchiness, even confusion were starting to seep into my life in exchange for raiding. After one devastating migraine, I decided it wasn't worth it and I started seriously looking for alternate raid groups. Along the way, changing guilds started feeling like a breakup. It was, in fact, an emotional experience when I finally got around to saying goodbye to the raid. I still have alts in the guild, but leaving felt so permanent and serious. It hit me right in the gut. WoW is such a social experience for me. I don't think any of my CK guildies ever read this blog, but if they did I'd hope they know the reasons I left weren't personal. I think I did my best to convey that to everybody before I left. That brings us up to the next big question: where did I go? Almost since I started really using Twitter in earnest, I've followed a player named Tikari. He's helped me with my blog, my rogue, and even just the game in general. I like Tikari, in as much as you can like a person whom you've only really associated with in bits of 140 characters or less. Tikari is a member of the guild Apotheosis on Eldre'Thalas. Through Twitter I found several of his guildies and followed them as well. One was Kurnmogh, who came recommended to me when I asked my tweeps about a good Paladin to follow. Kurn just so happens to be the Guildmaster of Apotheosis. For several months now Kurn has been looking for a Ret paladin. Given the fact that their raid times end when mine used to begin, they were initially very attractive for that reason alone. Upon closer inspection, Apotheosis was alluring for so much more. After much deliberation, and consulting my lovely girlfriend (whom my raid times matter to very very much,) I decided to apply. The application process with Apotheosis was ridiculously pleasant. Whereas I've apped to heroic raiding guilds before and found the experience to be wooden and formal, everybody I talked to from Apotheosis was welcoming and nice. True, the application process was structured, but why shouldn't it be? When I applied, I started getting tweets from people in the guild giving me encouragement and preemptive welcomes. I really cant say enough for how nice everybody was to me. In the end I was invited to run a trial period with the guild. As of our first raid last night, I feel I've really hit a home run here. 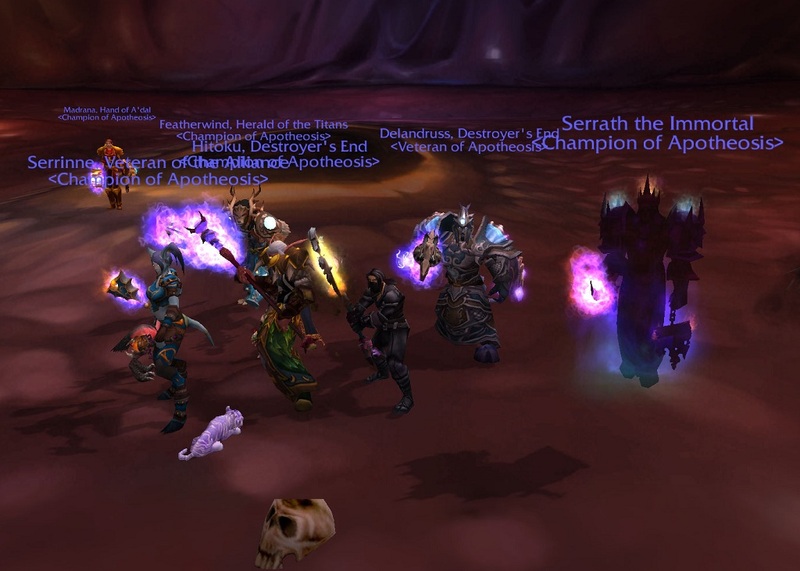 Last night we walked into Heroic Dragon Soul, 25 man, and handily downed Morchok and Yorsahj. The fact that I'm killing heroic bosses in current content is somewhat mind blowing, given the types of guilds I've always been in. Everything was organized and people did their jobs amazingly. I did okay. Morchok has significantly more movement on heroic, which will take some getting used to. Yorsahj hasn't ever been one of my favorite fights as a ret, but I think I did well. I did more DPS on that fight than I ever have, but I ended up being something like 11th or 13th on DPS. That's how good these players are. One of the best parts of the night, right behind when I won this hunk of burning love, was when Tikari whispered me and actually gave me feedback on my performance. I love it. We ended raid doing some progression work on heroic Zon'ozz. Our attempts were heartening, with one having the boss below 59%. I'm so excited to go back and contribute. This post is a little cheesy probably, but I can't deny that I'm happy with the way things have gone. Even if I hadn't gotten the #2 BIS weapon for a ret paladin, I would still be ecstatic with my new guild. I'm going to do everything I can to make this trial a slam dunk so they keep me around.